An “il-disciplinary” critical design duo talks about their recent work Rhythm of Life, a conversation piece for medical consent, feedback loops, and learning from biological systems. Where does design best converge with art and science? That’s what I wanted to know in my conversation with Thought Collider, a Europe-based critical design duo. 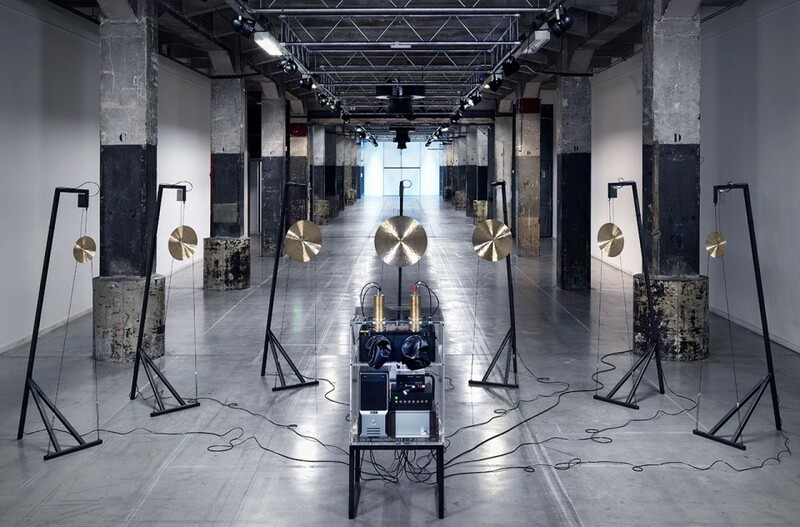 Their latest work, Rhythm of Life, a collaboration with artist Dave Young and scientists from the University of Leiden, is an installation capable of turning scientific data captured from willing participants into a brief concert played on custom singing gongs. To do this, the piece uses a photomultiplier tube, a technology capable of measuring “biophotons,” or particles of light emitted by the human body. Last week at the STRP Bie?nnale, the musical representations of datasets captured from the original 56 participants were played back publicly for the first time. Approaching the installation as a visitor, I was matched with one of the original datasets based on a short questionnaire revealing information about my own lifestyle. Thought Collider was curious to ask visitors: What do you hear of yourself in the music of your data-doppelganger? In designing this experience, they aim to suggest a future with different ideas of communication and new interfaces for interacting with our own biological processes. I sat down with Susana and Mike to talk with them about their philosophy of discursive design and how they manage to build a truly cross- disciplinary process. What drew you to collaborate with scientists from Leiden University for this project? Was there something about this technology that stood out to you? Mike: You know, often with these kind of technologies or protocols the value is almost pre-determined before it reaches our awareness. But for biophoton emission from our bodies, there are things that are becoming clearer about it, but it’s still very much an ongoing process of trying to understand what the data collected by the photomultiplier tube means in terms of the underlying biological processes. From an artist’s perspective, that’s very interesting because you have an open question to start playing with, you can play a role in trying to understand exactly what the meaning of this could be. The project’s very inspired by the scientists of course. Susana: A lot of our work is inspired by the biological, actually, and this installation, or instrument as we called it at one point, has allowed us to start talking with people about biofeedback loops, for example. When you’re able to “listen” to these emissions, you suddenly realize you’re giving off this energy. It’s being played back to you, it’s reabsorbing back into you in a sense. There’s this loop going there that might even allow you to start thinking about self- regulating systems. One of the themes of this project seems to be about searching for meaning in murky datasets. If I give off a certain number of biophotons, does that say something about me as a person? Mike: Right, that’s where the current ambiguity of the data we’re working with is quite powerful – in the present moment we don’t know what this data means, but that’s not to say that biophotons emitted by somebody couldn’t communicate something like their having a serious illness. Susana: Or even something else, because I mean, in a way this is a system of biological communication that already exists in our bodies. That certainly strikes a chord with things we’re hearing these days about the unknowns of sharing things like medical data or DNA information. What about the people you find yourself working with, scientists or technologists, are they also excited to collaborate with designers? What’s that process like? Susana: Well I think in our work, the idea is not just to complement science, but to find a middle ground where you can’t address questions purely through one discipline. A space where you really need to get people from different backgrounds together to find some kind of hybrid research process, methodology, object, artifact… something that helps you keep coming at the issue from many different perspectives. Mike: Yeah – we often say that we like to engage with emerging or dark corner technologies, and the reason I bring that up is that there is an inherent complexity in a lot of these topics. I think in our work we make an effort to engage directly with that complexity and not necessarily shy away from it. In a project like this, our role is not to just take what’s being researched already and translate that into something that’s communicable. Our role is to ask other questions of that research, and I think that’s typically what design does when it’s done well. So does that mean there are ways design can support scientific work as well as science giving more grounding to design concepts? What do you think that looks like? Mike: Yes, I think so. For starters, there’s a real need to get more people involved with or aware of technologies like this. There’s also the question of, what could you begin to perceive through an artwork like this that maybe you wouldn’t if you’re sat in a lab in the dark with a piece of scientific equipment taking measurements all day? It’s an amazing piece of equipment the scientists are working with, I mean it measures light from people’s bodies. There’s something really poetic about that which warrants exploration. I like to think that people at large can contribute to that. I read previously that you’ve called yourselves a critical art/design practice. Lately there’s been a resurgence in the trend of speculative design, or using design not towards an end product, necessarily, but instead as a tool for discussion about where we’re headed as a society. Do you identify with that term yourselves? Mike: That might depend on your definition of speculative design, actually. What’s your definition of speculative design? Mike: I think we definitely relate to speculative design. Where we’re like speculative designers is that we believe in creating experiences which allow us to probe different questions or contexts. To contrast with some other types of speculative work though, for us, it’s really about having physical artworks that are rooted in the here and now. So in this project, the photomultiplier tube is very much a technology that exists, the work is being developed based around a real piece of equipment. We use intimate experience with that equipment to ask bigger questions that might implicate other futures, but at the same time we’re not trying to make massive mental leaps. We’re trying to make sense of the world that we’re living in. Okay, so in exploring ideas about the future or promoting that discourse you prefer not to jump too far ahead, or into an alternative reality, for example. Susana: I think we’re more interested in understanding existing circumstances. I mean, the technology is just a starting point for us to discuss other ways of knowing and different methodologies for gaining an understanding of these biological communication systems, for example. Like many critical designers, you seem to draw on elements from art, design, science… Which methodologies or mindsets do you prefer from each discipline? Susana: A lot of our work is developed around scientific themes, but we’re not necessarily wanting for it to be constrained by scientific practice. In some way it also has to do with this questioning of what truth is really about, you know, or what can constitute truth. In this work for example, the minute you start to talk about light emitting from your body there’s this idea of “auras,” from parapsychology, which is essentially labeled a pseudoscience. But it’s also interesting to note that a lot of the principles that were scientifically investigated in the 60s or 70s by DARPA, for example, are also very much at the core of alternative medicine practices. So sometimes it seems it’s more about what system is in place that’s able to justify or certify which findings are truthful or valuable or not. I wouldn’t say we are linked to one system or another, we just kind of enjoy the in-between position. Mike: Right. When you think about the scientific method, it’s often about trying to disprove certain outcomes in order to show that something might be true, whereas we don’t come at it quite from that perspective, we maybe look at it from a more open starting point. I wonder if it’s your design background that makes you more open? Mike: Yeah, probably. I think its fair to say. Susana’s background was originally fine art, mine was graphic design, and I think we’ve never really stayed within a fixed discipline for that long. We’re probably quite transitory. Susana: Il-disciplinary we call it. Mike: We’re il-disciplinary, we’re always moving around from form to form, so I think yes, probably it’s the openness that we take from design. But I think where we differ from design is that we don’t really believe in the classic notion of solving problems or offering solutions to things, because I think that tends to immediately assume that the question that’s being asked is the only question, or the correct question. We’re more interested in taking a more open and exploratory approach to see what might come out of it. Susana: Right, and it’s not always the case, but often in design there’s this emphasis on the object as a final product, or it can be very object oriented. Maybe in an earlier stage of our work we would have aimed for the object itself, but now we’re talking about a lot of the objects we create as “collateral artifacts,” so almost like spin-offs from a longer term, wider research process that is taking place. That’s interesting, because one of the criticisms of design is that there can be too much of a focus on short-term projects. What benefits do you find in moving away from that? Susana: A lot of our efforts do become really long term investigations, and we really enjoy that because you can dip in and out but you’re not always just saying the same one thing. You know, you have some time also to digest how you’re thinking or talking about something. Mike: Initially we were doing research work, so its kind of logical that you’d approach it in a long-term way, and that you really need to take the time to develop your point of view. I mean we research because we don’t know, not because we know. So I think that also implies a different kind of mindset. A different mindset in how you present the work too, maybe. Mike: Yes, because in this way there’s something new to learn every time you show something. So we try to think of every exhibition or sharing point as just another experiment. It’s another chance to try something else and learn something new. Susana: There are all kinds of processes taking place beyond the range of human perception. We find that very exciting, to take some of these ideas further and to see how people respond to it. The latest iteration of Rhythm of Life was presented at the STRP Bie?nnale, an international festival connecting creativity and technology, in Eindhoven, The Netherlands. Thought Collider is currently based in London and Amsterdam. You can follow their work on their website here. This interview is written in the context of the masterclass STRP Makes Sense in cooperation with Creators.